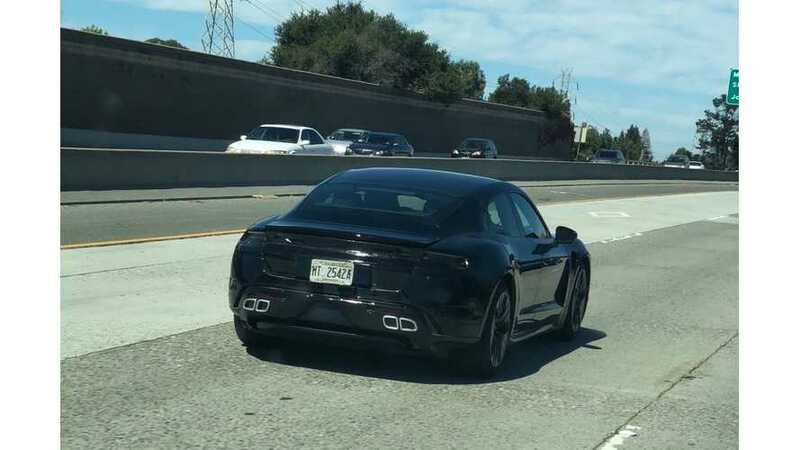 Porsche Taycan prototype spotted in Mountain View. Porsche seems to be testing the prototypes of its first all-electric model - the Taycan - all over the world, and recently one of the camouflaged test mules was spotted in Mountain View, California. It's slightly different than the prototype seen in June in Montclair, New Jersey, so we believe it's a newer version. There are new rear lights, wheel covers and... a different fake exhaust setup. According to Porsche, the Taycan will be capable of sprinting from 0-62mph (0-100km/h) in as little as 3.5 seconds. This puts the Taycan in some select company like the Dodge Charger SRT Hellcat, the Mercedes-Benz E63 AMG or the BMW F90 M5. While yes, this does put it at a disadvantage with the Tesla Model S, we’re confident that the Taycan will be a more performance driving optimized vehicle. Not just a straight line beast. Pre-orders for this upcoming luxury sedan have already started in the United States and several other countries. Customers are able to do a Tesla-like deposit in order to be among the first in the world to take delivery of Porsche's first pure electric car.